Outliers in data can distort predictions and affect the accuracy, if you don’t detect and handle them appropriately especially in regression models. Why outliers treatment is important? Because, it can drastically bias/change the fit estimates and predictions. Let me illustrate this using the cars dataset. To better understand the implications of outliers better, I am going to compare the fit of a simple linear regression model on cars dataset with and without outliers. In order to distinguish the effect clearly, I manually introduce extreme values to the original cars dataset. Then, I predict on both the datasets. # Inject outliers into data. 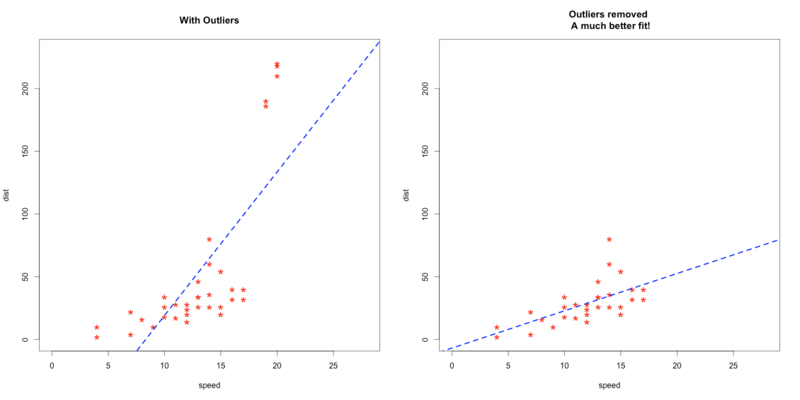 cars_outliers <- data.frame(speed=c(19,19,20,20,20), dist=c(190, 186, 210, 220, 218))  # introduce outliers. cars2 <- rbind(cars1, cars_outliers)  # data with outliers. # Plot of data with outliers. # Plot of original data without outliers. Note the change in slope (angle) of best fit line. Notice the change in slope of the best fit line after removing the outliers. Had we used the outliers to train the model(left chart), our predictions would be exagerated (high error) for larger values of speed because of the larger slope. For a given continuous variable, outliers are those observations that lie outside 1.5 * IQR, where IQR, the ‘Inter Quartile Range’ is the difference between 75th and 25th quartiles. Look at the points outside the whiskers in below box plot. outlier_values <- boxplot.stats(inputData$pressure_height)$out  # outlier values. 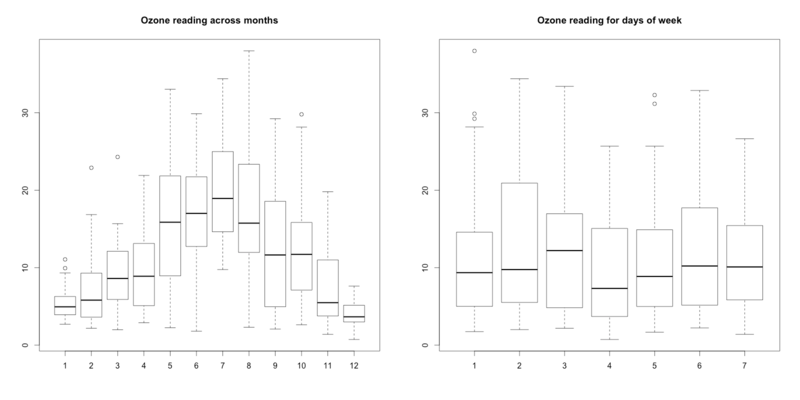 boxplot(ozone_reading ~ Month, data=ozone, main="Ozone reading across months")  # clear pattern is noticeable. boxplot(ozone_reading ~ Day_of_week, data=ozone, main="Ozone reading for days of week")  # this may not be significant, as day of week variable is a subset of the month var. What is the inference? The change in the level of boxes suggests that Month seem to have an impact in ozone_reading while Day_of_week does not. Any outliers in respective categorical level show up as dots outside the whiskers of the boxplot. 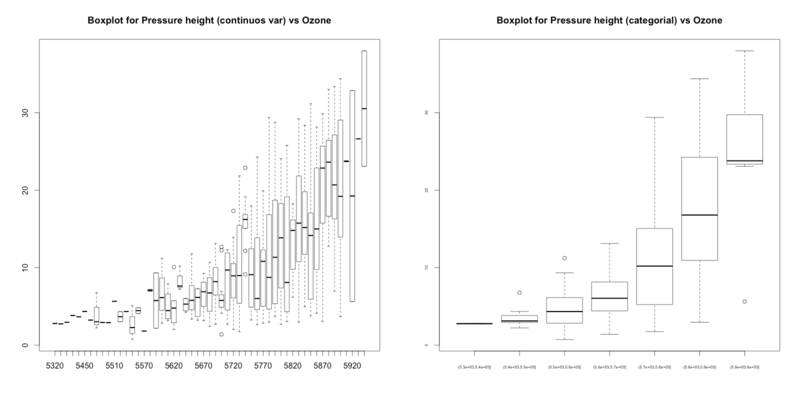 You can see few outliers in the box plot and how the ozone_reading increases with pressure_height. Thats clear. Cook’s distance is a measure computed with respect to a given regression model and therefore is impacted only by the X variables included in the model. But, what does cook’s distance mean? It computes the influence exerted by each data point (row) on the predicted outcome. The cook’s distance for each observation i measures the change in Ŷ Y^ (fitted Y) for all observations with and without the presence of observation i, so we know how much the observation i impacted the fitted values. 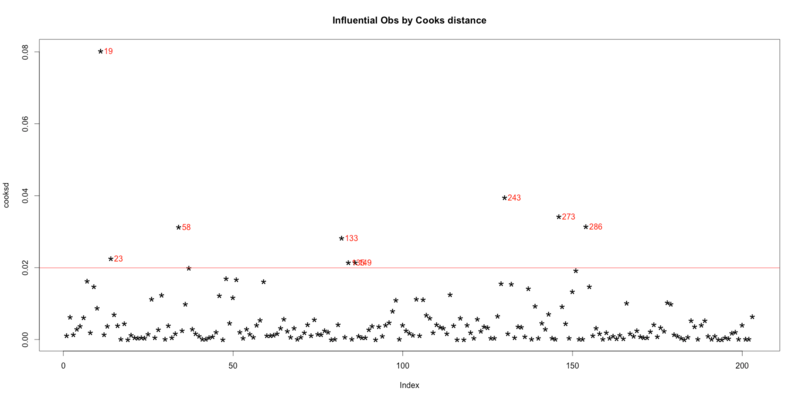 In general use, those observations that have a cook’s distance greater than 4 times the mean may be classified as influential. This is not a hard boundary. Now lets find out the influential rows from the original data. If you extract and examine each influential row 1-by-1 (from below output), you will be able to reason out why that row turned out influential. It is likely that one of the X variables included in the model had extreme values. head(ozone[influential, ])  # influential observations. Lets examine the first 6 rows from above output to find out why these rows could be tagged as influential observations. Row 58, 133, 135 have very high ozone_reading. Rows 23, 135 and 149 have very high Inversion_base_height. Row 19 has very low Pressure_gradient. The function outlierTest from car package gives the most extreme observation based on the given model. This output suggests that observation in row 243 is most extreme. The outliers package provides a number of useful functions to systematically extract outliers. Some of these are convenient and come handy, especially the outlier() and scores() functions. outliers gets the extreme most observation from the mean. If you set the argument opposite=TRUE, it fetches from the other side. There are two aspects the the scores() function. Find out observations that lie beyond a given percentile based on a given score. #>  0.68458034 0.44007451 2.17210689 3.88421971 0.66539631  . . .
Once the outliers are identified, you may rectify it by using one of the following approaches. Imputation with mean / median / mode. This method has been dealt with in detail in the discussion about treating missing values. Another robust method which we covered at DataScience+ is multivariate imputation by chained equations. For missing values that lie outside the 1.5 * IQR limits, we could cap it by replacing those observations outside the lower limit with the value of 5th %ile and those that lie above the upper limit, with the value of 95th %ile. Below is a sample code that achieves this. In yet another approach, the outliers can be replaced with missing values NA and then can be predicted by considering them as a response variable. We already discussed how to predict missing values. If you liked this post, you might find my video courses Introduction to R Programming and Mastering R Programming or to visit My Blog.